It’s all right here! 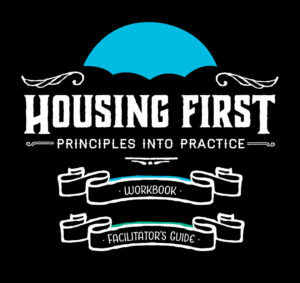 Well, actually right here, where today we’ve officially launched our ‘Housing First: Principles to Practice’ toolkit, a workshop that explains in nuanced ways what the Housing First model is and how it works. On that page you’ll find the five videos, each one explaining one of the five principles of Housing First and how to incorporate them into your work, teach them to others, or just have a better understanding of this successful approach to ending homelessness. If you’re part of a nonprofit that provides housing or services to homeless folks, the Workbook and Facilitator’s Guide are absolutely free! Just email us and we’ll send you the password and links to the PDFs of the Workbook and Facilitator’s Guide so you can go through the workbook on your own, or put on the workshop for your coworkers. And be sure to tell others about it.